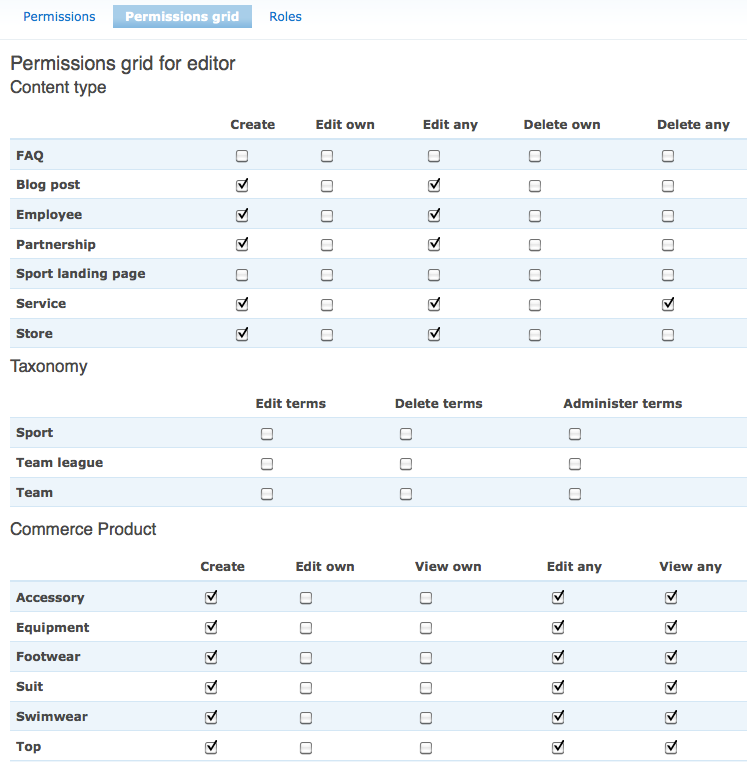 I've just released Permissions Grid. It does what the name suggests: it presents related permissions in a grid, rather than the usual long list. This gives an easy to grasp overview of what a role can do with different objects on the site: which node types can this role create? which can they edit, or delete? which product types can they edit? which vocabularies can they create terms in? If this sounds and looks vaguely familiar, that's probably because this module has an ancestor: my Drupal 6 module node permissions grid module, which I wrote back when a site's content types started to become too numerous to easily make sense of. That operated only on node types, and like a great many contrib modules porting to Drupal 7, it's had to 'drop the node' and generalize. But in fact nothing restricts Permissions Grid to entities: all it cares about is permissions. Structured permissions are declared to the module in an info hook, and each module may declare multiple sets of permissions. This allows for the fact that some modules add further vocabulary-related permissions which do not have the same pattern, and that commerce has entity permissions in both singular and plural form. Are there any groups of permissions I've missed, whether in core or contrib? Post a feature request, or better still, take a look at the hook implementations already there and file a patch.